When you think of camping, beautiful weather and an escape from reality come to mind. The true reality of camping is that if you do it enough you will get rained on. 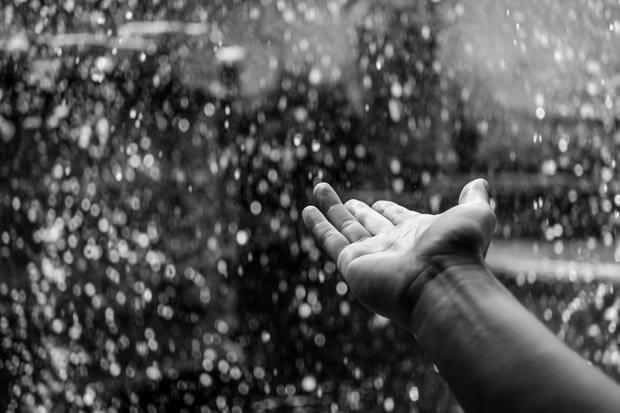 Instead of having a miserable experience you can be prepared, and camping in the rain can be very enjoyable! Just last weekend I experienced one of the more dramatic rain camping experiences I have ever had. As we pulled into our campsite the skies looked gray. We decided to get the tent up before the rain started. As we quickly got set up, small sprinkles fell. We also made sure to put a tarp underneath the tent and to get the rain fly on right away. We made an aqueduct system by the campfire ring to drain the water away from our pit. As the final stake was driven in, the clouds rolled in and the downpour began. 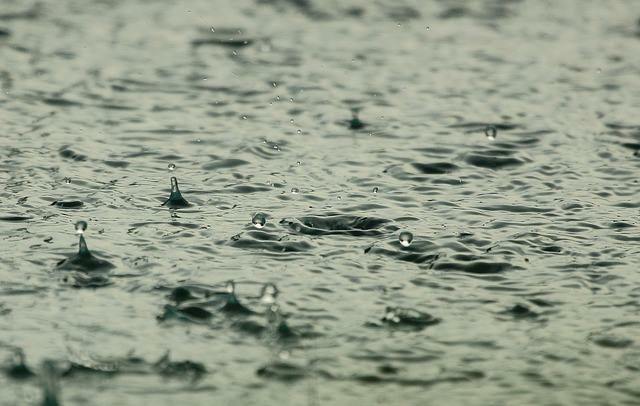 This wasn’t a quick 10-minute shower; it was a two-hour long hard rain. We waited it out in the car, playing cards and chatting. When the storm finally passed and the sun reappeared we found our campsite under an inch of water. We set up our tent on the highest ground at an angle so the water could run away from it. We also made an aqueduct system by the campfire ring to drain the water away from our pit. By keeping all of our supplies in the vehicle we knew we wouldn’t have to deal with wet equipment. Overall it was an eye-opening experience and it taught me a few things. 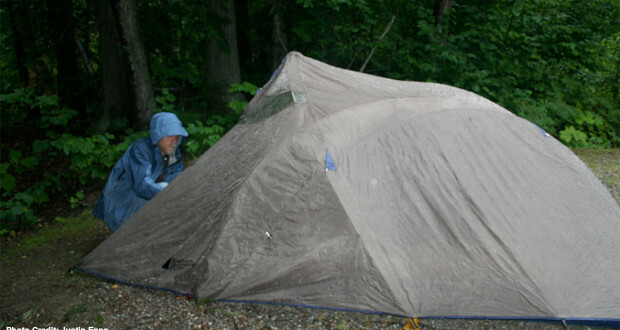 If you plan on camping on a semi-regular basis and you want to stay dry, you’ll need a good tent. You will be glad you spent the extra money during inclement weather. Although there are a lot of factors that go into choosing a tent, one consideration is to make sure that your tent has a full rain fly with a good overhang to let the water drip away from your tent and also prevent splashing of mud. Make sure the coating of the tent is waterproof and that it has good seals. 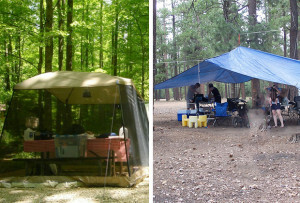 It doesn’t matter if you have a $50 tent or a $300 tent – if you place it at the bottom of a slope where water will collect, your tent will get soaked. ALWAYS look for the highest ground at your campsite. Angle it so the water is running away from you, not toward you. Look for any signs of previous flooding (washouts, narrowly closed areas) as this can happen quickly during a storm. 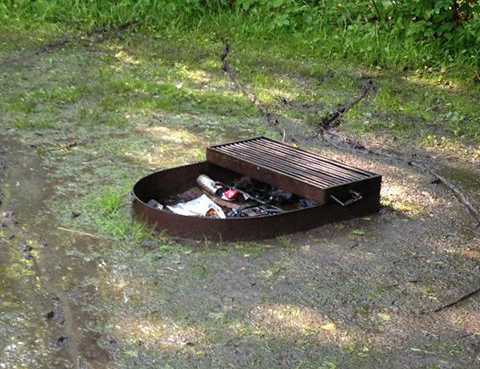 Camping in the rain can cause you to rethink the gear you have packed. Always make sure to have shammys or other water absorbing cloth to wipe down picnic tables, chairs, the dew from the inside of the tent, etc. It is also advised to pack extra clothes in case you get wet. I also throw a pair of clothes in a waterproof bag just in case my whole bag gets soaked, so I will have something dry to put on. Bring a pair of flip-flops or easy slip-on shoes to put at the front of the tent so you don’t drag mud in (crocs are perfect). 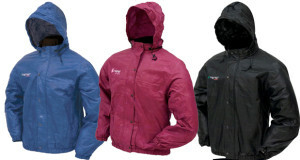 Rain gear is a must and can turn a miserable trip into something much more enjoyable. It allows you to venture outside regardless of the conditions. We all know that rain can put a damper on fun outdoor activities so make sure you have plenty of indoor tent activities too! Books, cards, travel or word games, and drawing materials are a great way to wait out a storm in the comforts of your tent. A shelter is always a good idea and can make the trip much better providing protection from sun or rain. Staying dry while camping comes down having a proper shelter. Your tent or car can always be a refuge for a short period of time but you still need to cook food, have a place to eat, and be able to move around. A tarp is a must, and also provides protection from the sun. 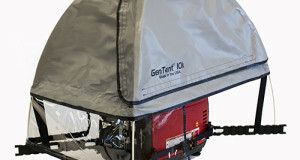 If you are not a do-it-yourself type of a person a screened tent is also a great way to go. If the rain is coming in sideways they’re not the best, but they’re better than nothing. My two favorite ways to rig a tarp are ridgeline and center pole. Ridgeline: Grab some good, strong rope and run a line between two trees. Have someone stand on a picnic table or cooler to tie it, as it needs to be fairly high. Then simply drape the tarp over and tie the four corners either to other trees, the ground, or even a vehicle. Center pole: Find a recently downed tree that is a little bigger in diameter than a pop can, and is roughly 10-12 feet tall. The height, of course, depends on how big your tarp is. It’s better to get a longer one because you can always shorten it. Next, tie the four corners off at head height. It’s a little more work, but I like to insert bungees into each rope to add more flex. Lastly, pop the pole up in the middle and put some rocks around the bottom to make it stable. You can make it even more solid by putting duct tape on the top of the pole with the sticky side out before you raise it. That guarantees that it won’t come down even in the heaviest storm. No one wants to get rained on when camping, but if you plan for it you can have just as much fun as sunny skies. Some of my most memorable camping trips involved playing cribbage under a massive tarp while it poured for hours. Take the time to prepare!